Running with SD Mom: #WeRunSocial MeetUp, Carlsbad Marathon Expo and a busy Saturday! #WeRunSocial MeetUp, Carlsbad Marathon Expo and a busy Saturday! Yesterday, I presented the Carlsbad Recap. Today, I go back another day and bring you a recap of the Expo and all the fun! I knew that Saturday would be a SUPER busy day. Running around the expo, heading to the finish line of the SD50 miler and all the other things I had to do in between. I thought, hey! Why carry a purse? I will try out this new run belt thing! And before you ask, that IS my iPhone 6 safely zipped up inside (GIVEAWAY coming tomorrow)! S and I headed to the Carlsbad Marathon expo dressed in our We Run Social gear! We met up with Marlon, Jenn, Carlee, Kristin and the rest of the We Run Social crew! 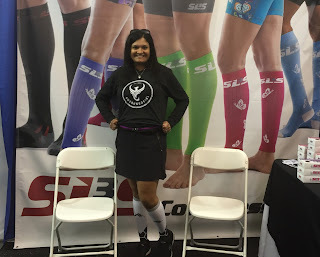 We met at the Pro Compression booth and took an Ambassador photo! And the company that makes the awesome Run Belt. We then drove over to 83 Degrees Restaurant in Carlsbad to continue the party and giveaway more goodies! Thank you to our very generous sponsors - Mamma Chia and Big Slice Apples! We got to try the 4G bars from Mamma Chia long with their green machine and Cherry Beet squeeze pouches. We tried all sorts of flavors from Big Slice. A big hit with the kids! And the mamas also had a great time catching up! And I FINALLY got to meet the awesome Pam in real life! But a big thank you to my partner in hosting, Kristin. She is a PRO! Then it was time to run home, run some errands and then make dinner for the family. Then I headed back out to the finish line of the SD 50 miler to catch up with these rockstars and bring them their sodas. When I asked Jenn and Vanessa what they wanted me to bring them at the finish line, they wanted ice cold soda. Jenn wanted ginger ale. Easy enough but I found that in the 3rd gas station I looked at. Vanessa was much tougher and wanted grape soda. NO GRAPE SODA ANYWHERE! I settled for orange soda at the 4th place I stopped at! Look how awesome they look! I look haggard after 20 miles...not these two! And they smelled delicious too. No joke! My goodness! That was a busy Saturday but every second was worth it! Inspirational and fun! I am linking up this post with Tuesdays on the Run blog link up with My No-Guilt Life, MCM Mama Runs and Marcia's Healthy Slice! Have you ever cheered in people at a finish line? What is your favorite part of an expo? Have you been to a We Run Social meet up? Do you wear a Run Belt? (Giveaway coming tomorrow! But if you don't want to wait, this is a special limited time introductory pricing of the Dual Pocket Run Belt - http://www.amazon.com/dp/B017DRIKFY You can receive the belt for nearly 50% off! ($12.90 instead of $29.00) Plus free shipping!) Disclaimer: I received the Run Belt for review purposes. I was not compensated in any other way. I have three different running belts, slowly upgrading to larger/different ones to suit my needs. The one I bought for my first half 5 years ago now seems ridiculously small compared to my newest one! (It won't even zip with my iPhone 6 inside!) I also tend to wear mine on field trips, sporting events or kid activities when I don't want to carry my purse! Love the dedication to getting those finish line treats! I love, love, love that you guys all wore your WeRunSocial shirts. I wish I lived closer so I could meet up with y'all! Run belts- not just for running :) Definitely a step up from the fanny pack. Looks like so much fun! Actually I love cheering at the finish line! What a busy and fun weekend! I ran Carlsbad a few years back and had a blast. I need to make one of these WRS meetups on of these days! I crewed for the Leadville 50 miler and that finish line was just amazing. you needed one of those soda machines where you can pick whatever flavor you want!